Massarapal is a Dunmer trader who belongs to the Erabenimsun Ashlander tribe. He has a yurt in their camp in the Molag Amur region where he trades in all types of goods and offers repair services. 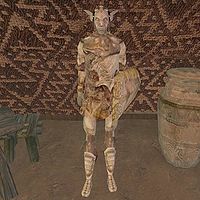 As a member of the Erabenimsun Tribe, killing him will anger the tribe and prevent you from completing the Erabenimsun Nerevarine quest, a required part of the Main Quest. This page was last modified on 20 January 2014, at 18:58.